Spend a nice holiday in the house on the sunny side of the hill located in a quiet part of a protected area. In spring and summer listen to melodious birds singings, in the autumn watch the play of colours in mixed forests and in winter snowy hills. The enclosed house offers you a good level of comfort with four bedrooms, equipped kitchen, two toilets, bathroom with bath tub, terrace outside and inside and garage. Parking place for four cars is common. On warm evenings you can sit around the outside fire, which is a very romantic experience. This house is very old; it was built in the year 1910 after a devastating fire. It was renovated in 1999. The house is perfect for two families with children. Pets are allowed and behind the fence you are ensured that your darling stays with you. We do not hide any costs out of the showed price, you see total price for your stay, except dog. For the dog you pay a small surcharge of 15 Euros. Speciality: Cervenice means „red earth“, it is typical feature there, because there was big volcanic activity in the past period and therefore had made the earth around the hill Kozakov deep red. Kozakov is world known place as habitat of precious stones, which were cuting and polishing in workshops in Turnov. Kozakov offer ideal conditions for paragliding. Tourisme and other possibilities: In the Bohemian Paradise are most of marked trails for walking or biking, many castles, rocky cities an forests. Perfect place for tourist activity. There is big swimming pool 5 km far, Shop possibility is 2,5 km, supermarket 5 km, restaurant 3,5 km. Beautiful romantic house, lovely quiet place, everything you need for your fantastic holiday !!! Schönes Haus in ruhiger Lage. Viel Platz. Alles was man braucht vorhanden. Sehr freundlicher Gastgeber. Schöne Gegend. Vielen Dank. 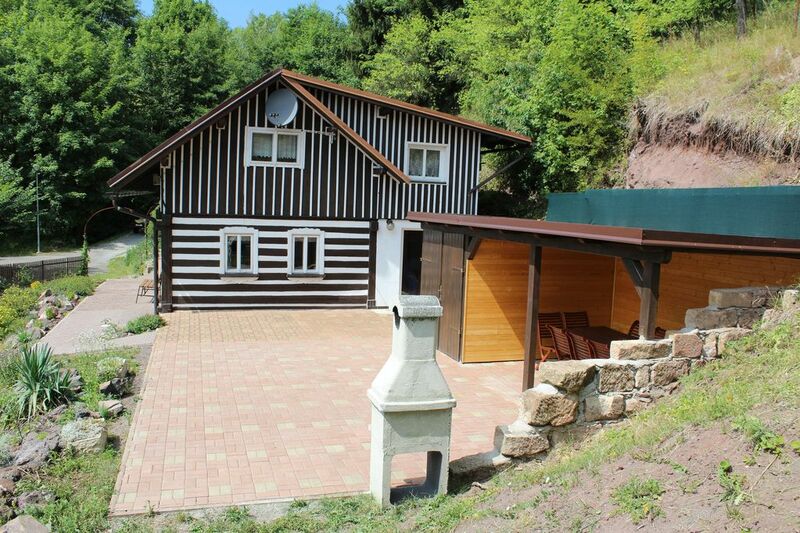 Dieses Ferienhaus hat unsere Vorstellungen vollumfänglich erfüllt. Sehr ruhige Lage, sehr gut eingerichtet, ausgesprochen sauber, sehr freundlicher und hilfsbereiter Vermieter, große sonnige Terasse mit umfangreichen guten Gartenmöbeln, perfekter Ausblick. Dieses Objekt können wir rundum weiter empfehlen. einfach gehalten aber mit allem ausgestattet was man braucht und gemütlich. Besonderer Pluspunkt : reichlich Handtücher und die Betten bezogen. Das große Extra-Mitschleppen blieb aus. Tolle Lage : absolut ruhig und doch zentral gelegen zu allen Wanderrouten und Sehenswürdigkeiten. Immer wieder gerne. Der Gesamteindruck war einfach nur toll. Der Vermieter hat sich wirklich Mühe gegeben. Das Haus liegt in einer atemberaubenden Gegend. Ruhig gelegen und super zum entspannen nach einem anstrengenden Ausflug. Das ganze Haus hat einen sehr sauberen Eindruck gemacht. Der Vermieter hat uns über Reiseziele informiert und uns herzlich Empfangen. Immer wieder gerne. Berge Wasser Burgen und günstig...und im Sommer komm wir wieder! Cervenice is a small place with a few houses in the surroundings, located 10 km east of Turnov and close of Kozakov hill (744 m). Turnov is a small town with 15.000 people, a historic and cultural centre, called the hearth of Bohemian Paradise. Wander for hours through deep forests, rock – cities, visit old castles and remains, cool in the Dolomit caves or simply laze on the terrace of the house. This all offers you the oldest protected, extraordinary diversified area in the Czech Republic. Bohemian Paradise is member of the worldwide network of Geoparks UNESCO. With its advantageous location and perfect road connection with Prag city, in just one hour walk via the world known Charles bridge, you are in the medieval city or Prag Castle. Close, north of Bohemian Paradise the highest mountains in the Czech Republic are situated, Krkonose, sought-after its Nordic flora and fabulous ski terrains. Ski: Close to the house are 3 lifts, one with snow cannon. Pure ski centrum Harrachov is 35 km far. There you can have all facilities you need for full skiing. Alles im Preis inbegriffen (Endreinigung, Strom, Wasser, Bettwäsche, Handtücher, Geschirrtücher). Nebenkosten: Hund 15 Euro pro Woche. Preis pro Nacht 130 Euro. Mindestaufenthalt 3 Nächte.